HOLDEN, W.Va. — Fifty-one elk completed their journey from Arizona and were released into a holding facility in Logan County earlier this month. 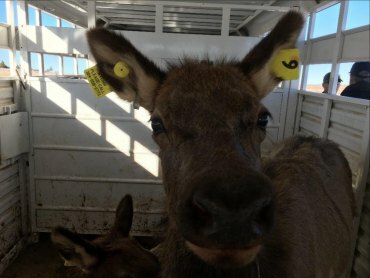 The elk, which are part of West Virginia’s elk restoration project, were captured in late January and held near Flagstaff, Arizona for disease testing. The elk arrived at the holding facility near Holden, West Virginia, late on March 4. “It has been a wonderful experience working with the wildlife professionals in Arizona and all of the private supporters who are helping make West Virginia’s elk restoration project possible,” said DNR Director Stephen McDaniel. DNR Law Enforcement and Wildlife Resources staff transported the elk through a partnership with Energy Transportation LLC of Bridgeport, and EQT Corporation. David Alvarez, owner of Energy Transportation, and Greg Hoyer of EQT donated use of their company’s trucks and expenses from transporting the elk to West Virginia. The trip took 31 hours. This group of elk will join more than three dozen elk previously brought in from Kentucky over the past two years. The Arizona elk will be quarantined until they are released onto the Tomblin Wildlife Management Area in Logan County, as directed by the United States Department of Agriculture. Each elk is equipped with a Global Positioning System (GPS) radio transmitter to monitor its movements. All GPS transmitters were purchased and donated by the Rocky Mountain Elk Foundation.